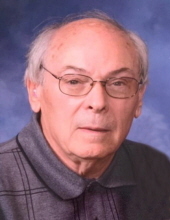 John P. Boggie, 77, DeWitt, formerly of Waterloo, died Thursday, March 28, at Maggie’s House in DeWitt. John was born September 25, 1941, in Cedar Rapids, the son of Carroll and Lola Schatz Boggie. He married Frances Fitzgerald. They later divorced. He then married Gloria Kloberdanz August 6, 1983, in Waterloo. She died March 24, 2018. John was employed by Warren Transport as a data processing manager for over 20 years before retiring in 1999. He served his country honorably in the United States Army. Survived by: his stepdaughter, Karla (Kevin) Klein of Dubuque; a stepson, Kenneth (Tricia) Stirm III of Des Moines; a grandson, Nicholas Klein; three granddaughters, Hailey Stirm, Samantha Klein, and Kayla Klein, three nieces; and a nephew. Preceded in death by: his parents; and a sister, Nancy Kroeger. Mass of Christian Burial 11:00 a.m. Thursday, April 4, at St. Edward Catholic Church and burial to follow at Mt. Olivet Cemetery where full military rites will be performed by the Waterloo AMVETS Post 19 the Evansdale Post 31 along with the Iowa Army Honor Guard. Visitation will be for one hour before the service at the church. Hagarty-Waychoff-Grarup Funeral Service on West Ridgeway is in charge of the arrangements. To send flowers or a remembrance gift to the family of John Peter Boggie, please visit our Tribute Store. "Email Address" would like to share the life celebration of John Peter Boggie. Click on the "link" to go to share a favorite memory or leave a condolence message for the family.